Snorkel right outside your villa on the quieter north side of Grand Cayman - where you will enjoy cooling sea breezes (the a/c is often a choice, not a necessity!) and breathtaking uninterrupted views of the ocean. No traffic jams, just the gentle sound of the waves breaking on the reef to lull you to sleep. Morning coffee on the lanai is the perfect way to start the day! Free cable TV, broadband connection for your laptop, DVD player, music system, and large supermarket 20 minutes away in Countryside Shopping Centre, half a dozen great restaurants (2 - 10 minutes away), famous Rum Point lunch/beach bar with Red Sail Sport's diving/snorkeling/stingray city trips/wave runner rental (7 minutes), convenience store (2 minutes), Queen Elizabeth botanic park (5 minutes - the colored gardens and the blue iguana breeding programme are well worth the $8 entry). Remodeled kitchen with granite counters and warm cherry cabinets. Phone for incoming/local calls. Frank & Del McGill have been traveling to the Cayman Islands for over thirty years. They so enjoyed it that they bought this villa nine years ago and now split time between Gilroy, CA and Grand Cayman. Had a fantastic weeks vacation. Can't beat the location and proximity to the ocean, but the house is well taken care off and feels 'homely'. Great location for a relaxing Cayman vacation. If the wind had cooperated the snorkeling would have been fabulous. Great location with amazing beach. Very private. Well stocked. Tons of fun games and beach toys. The owner is very helpful and kind. Wonderful week...Great location...fabulous place to stay! We spent a week at #5 Azure Breeze just recently and it was wonderful! We found that the house had everything we could possibly need and more. It was very clean, spacious and very comfortably furnished. A full kitchen let us eat breakfast in every morning, pack a picnic lunch most days and then flip a coin on eating in or dining out for dinner! We even grilled one night! We loved the flexibility it gave us. The house is right on the water with a lanai out the back door. We started and ended every day there either sipping morning coffee, enjoying a glass of wine at sunset or just sitting and watching the sea. We snorkled once or twice right out the back door, but it was a little windy while we were there so we had more success snorkeling down the street at both Rum Point and Starfish Point where it was more sheltered. We rented a car for the week which was well worth it. 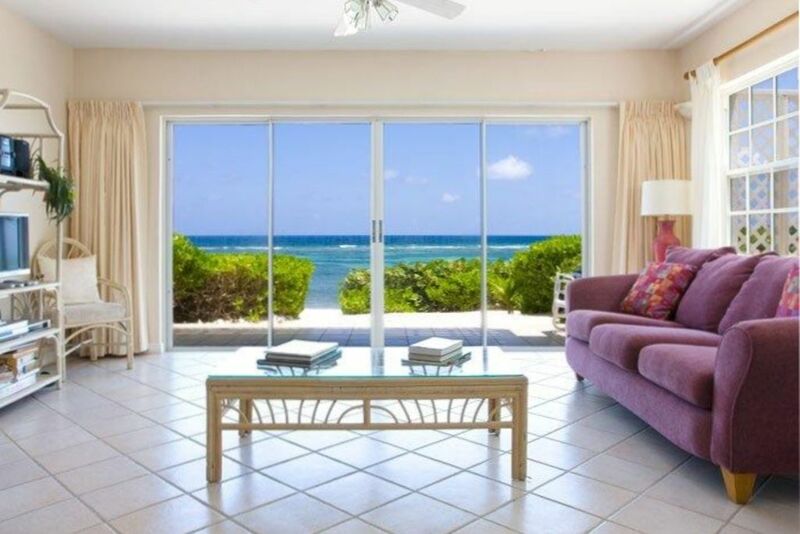 The house is located on the North Side, a short ride away from Seven Mile Beach. We fell in love with the location because it was away from the George Town cruiseport crowds and close to so many other things worth exploring(Rum Point, Starfish Point, Crystal Caves, Botanical Garden, Mastic Trail Pedro St. James). We also explored the quieter East End. The house is perfectly situated to all of these locations. Frank and Dell provided us with a packet of information regarding dining choices, activities, beaches, and local highlights before we arrived. This was invaluable as we were able to make several reservations ahead of our arrival and we arrived feeling like we knew what to expect and where to find things on the island. Such a great, relaxing time! Thank you for sharing your beautiful home! It was a great place to stay and we thoroughly enjoyed our visit. Highly recommend this place. It was all we hoped it would be. Great place for a family visit.